Lollipop men and women are being issued with headcams in Warwickshire after they reported a rise in the number of attacks and abuse. The cameras are designed to capture motorists abusing the school crossing patrollers which could results in large fines and penalty points. Warwickshire County Council said the cameras will be rotated among staff. Beverley Kingstone, a patroller in Nuneaton, said she had experienced less abuse since she used her headcam. "It's made a big difference, definitely a lot less abuse. Drivers are actually stopping a lot more for us now." 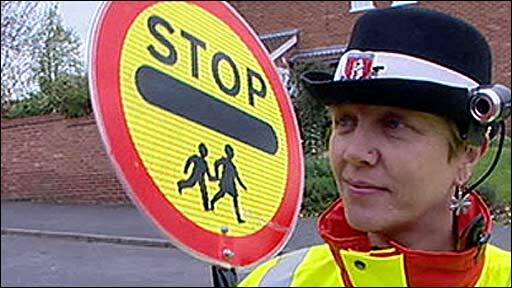 It is an offence to fail to stop at a school crossing and if drivers are caught they could face a £1,000 fine and three points added to their licence. The headcams record footage digitally and the audio and visual evidence captured can then be used in court. Several police forces in England have also trialled headcams for officers in a bid to reduce incidents of violent crime. Last May, traffic attendants in Salford became the first in the UK to record their work on video.